"Some people are fifty and still infantile. These last two days I've grown thirty years. I've wasted time." 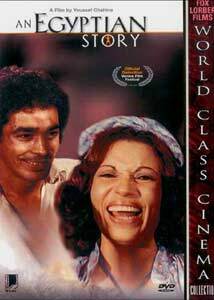 An Egyptian Story (Hadduta misrija) is Egyptian director Youseff Chahine's second film about Yehia, now a middle-aged, successful but unhappy film director. During production on his latest film, Yehia suffers a heart attack and travels to London to undergo bypass surgery. During his surgery, Yehia slips into an imaginary court trial held literally inside his chest, putting his younger self on trial for his own assassination. The court proceedings are interrupted by extended flashbacks of Yehia's life to this point, featuring Mohsen Mohiedine as the 18-year-old Yehia (reprising his role in Alexandria... Why?) and Oussama Nadir as the boy. His wife, mother and sister squabble over the rights to his life and affection, and the filmmaker is forced to reevaluate his art and his conflicted relationship with his home city of Alexandria. It's a good idea to see Alexandria... Why? first, as many of the returning characters are not explicitly re-introduced. Writer/director Youssef Chahine continues the semi-autobiographical saga of Yehia here, with flashbacks providing additional insight into the events of the first film. It's a surprising sequel, in that a great deal of time has passed and Yehia has undergone significant changes—he is no longer the idealistic young man seen in the first film, though his creativity and sensitivity remain. The adult Yehia is stressed and ill from the accumulated effects of cigarettes and high cholesterol; he has realized his filmmaking dreams, but his personal life is a shambles. Confronted with his own mortality, he devotes some serious thought (conscious and subconscious) to his life and its direction; the film is clearly an exploration of issues dear to the director's heart. Chahine realizes his ideas with creative sound and visuals, particularly in a brief scene in which the boy Yehia imagines himself crucified. The metaphorical trial that dominates the film's action is suitably realized onscreen, despite the film's obvious budget constraints—Yehia's heart and ribcage constitute a fairly large set, constructed from wood, simple tubing and nylon sheeting that communicates the right idea without attempting Hollywood-style pulsating foam-rubber-and-gelatin visuals. Chahine's talented cast delivers performances that are naturalistic and credible in general, allowing for some intentional hyperreality during the trial scenes. Image Transfer Review: Fox Lorber presents An Egyptian Story in its original 1.66:1 theatrical aspect ratio, with a letterboxed, nonanamorphic transfer. The transfer appears to have been taken from a broadcast-quality videotape— 3:2 pulldown interlacing artifacts are apparent, with video scanline glitches that become distracting in a couple of scenes. Dark scenes are often grainy with murky shadow detail. Still, the image looks pretty good, with acceptable detail, color and stability, and edge enhancement doesn't turn up to any great degree. It would have been nice to see a windowboxed anamorphic transfer taken from a film print, but the film is watchable and generally free of the softness and smearing common to video-originated transfers. Audio Transfer Review: An Egyptian Story features a Dolby Digital 2.0 monophonic soundtrack, in Arabic with occasional spoken English (English subtitles are provided.) The low-budget track suffers from occasional hiss and crackle, though these defects don't interfere to the point of distraction, and frequency range is narrow with occasional distortion. A competent transfer given the quality of the source. Extras Review: Fox Lorber's An Egyptian Story DVD features minimal supplements—a mere 8 picture-menu chapter stops, Filmographies and Awards for the writer/director and 5 cast members, a screen crediting the DVD production staff, and DVD-ROM Weblinks to the Winstar Video and Arab Film websites. The film's burned-in English subtitles cannot be turned off, so native Arabic speakers will have to put up with them. An Egyptian Story is an involving, creatively visualized drama that continues and broadens the story begun in Alexandria... Why?. Fox Lorber's DVD presentation suffers from a few quality problems and minimal supplements, but don't let that stop you from taking a look at this rich, thought-provoking Egyptian film. Recommended.